UPDATE 6/26/15 – The NCMEC has released a 10-year-old age progressive photo of Timmothy. Please put Pitzen in the search box on top right hand of page to read all the stories about Timmothy. 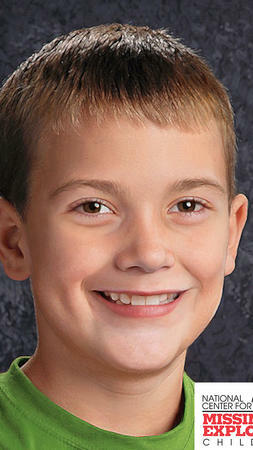 Original story: Timmothy Pitzen, 6-years-old is missing from Aurora, Illinois. He was with his mom, Amy. Amy was found dead in a motel room and now Timmothy is missing. The police gave a timeline on where they saw Amy and Timmothy and also who she talked to by phone, and one thing that stands out for me is that she picked up Timmothy from his Aurora school on Wednesday morning and Timmothy’s dad, Jim, reported them missing on Thursday around 1:00 a.m. He also said that Amy was not in a good place when he last saw her on Wednesday. The car seat that belonged to Timmothy Pitzen was located at his grandmother’s house; which has been confirmed by Aurora police. His Spiderman backpack and new clothes are still missing. You can read more about this story at the link. Forward the info to your friends around the Illinois area, so they can keep a lookout for Timmothy. • Based on sediments and plant material, the vehicle was stopped for an unknown period of time on a wide gravel shoulder, gravel road, or short gravel turnout either adjacent to, or just off of, an asphalt secondary road that had at one time, been treated with glass road-marking beads. • In close proximity to the gravel shoulder or road where the vehicle stopped, it backed into a grassy meadow or field to a spot that is nearly treeless. • There are birch and oak trees in the general area but not directly over or at the spot where the SUV stopped. Both Queen Anne’s Lace and black mustard plants grow in a row along the border of the field or the shoulder of the road. • In addition, there is no corn growing in or adjacent to the spot where the SUV stopped, nor is there any indication that the area had been used for agriculture in the recent past. Instead, the evidence strongly suggests that grasses have been the only major plants growing in the immediate area which leads scientists to believe that it is a meadow and not, for example, a field that had once been farmland and not recently sown. • Forensic results indicate that the grass was not cut which helps rule out a rural residential lawn or a park. • There is also a strong likelihood that there is a pond, small stream, or creek in the area. • Scientists further believe that the meadow is most likely in Northwestern Illinois with Lee and Whiteside Counties as the most likely locations. • However, areas in Carroll, Ogle, Stephenson and Winnebago counties cannot be ruled out. • Microtrace has since performed other tests but has not been able to further narrow down the six-county area – an area much too large for police to conduct ground searches. Are they SURE it was a suicide? For now. They still have to do a ME, but at the time she was found with her wrists cut, the police assumed it was suicide. Any possibility the little boy found in ME on Saturday morning could be Timothy? No, as Timothy is brown haired, brown eyed and the unknown boy was curly blond hair and blue eyes. Also, police confirmed suicide as cause of death for Amy on Tuesday morn. Did they put out an Amber alert??? Actually know as they have no vehicle and they do not know if he is endanger….I know…That's why I believe there needs to be another level of Amber Alert or to revamp the Amber Alert qualifications as they are now.